This review is by our highly talented affiliate blogger Sarah Hamilton from Popledge UK. Mika has produced an album of two halves, one keeps fans of tracks such as ‘Grace Kelly’ and ‘Big Girls…’ happy whilst the other pushes his music in a new direction. Album opener ‘Origin of Love‘ splits me in two. I really enjoyed the “monk-like” chanting used in the track but I am not a fan of using vocal effects on Mika’s voice. His vocals are special and unique enough on their own. ‘Lola’ is a lovely simple pop track, quite quaint in its production and comes complete with a classic pop hand-clapping moment. Mika has worked with Benny Benassi on a track called ‘Stardust‘. Whilst I can imagine it being played during a sunset in Ibiza, I feel that it does not capture Mika’s personality and needs a few further tweaks in production to fit into this LP. I dare anyone to listen to ‘Underwater’ and not think of Adele’s ‘Set Fire to the Rain,’. For the first 1.25 minutes of the track we are treated to an Adele homage before the track slips into a ‘Hurts’ sounding track. There isn’t anything in particular not to like about this but it feels like it is missing that sprinkling of gold dust to finish it properly. ‘Overrated‘ sees Mika bringing out his bitter side for a moment, the track is aimed at people in the media who are famous without having any talent or perceivable skills. The track features some club/dance moments and also the deep side of Mika’s voice which truly shows what an amazing range the man has. I really enjoyed the production on this track. It builds in increments into a nice sounding layered effect of Mika’s voice. ‘Kids‘ is a song I connected to on an emotional level and it is one of my favorites on this album. His vocals just sound so sad as he laments the end of a relationship, you really get that sense he is reliving those feelings and it’s hard not to get caught up in the track and relate it to your own experiences. ‘Love You When I’m Drunk’ is the track that is the most reminiscent of his 2006 breakthrough debut album. It’s a humorous moment in the album as Mika sings about the ‘beer google’ effect as he falls in and out of love with a man dependent on how much alcohol he has in his system! As the album progresses it gradually gets into more of the ‘pop’ genre. ‘Step with Me‘ is such a cute and warm song it could be on a Disney sound-track! I am not ashamed to say this was my favorite track on the album because it just made me feel so warm inside – imagine bathing in warm chocolate whilst sipping Champagne. It is that good! ‘Popular Song‘ continues in this vein sampling the ‘Wicked’ musical song amongst a female rapper and vocalist. ‘Heroes’ is another heart-felt track which I’m guessing is Mika’s take on young people going off to war. It’s a sad song about blood and the devils in your head which reminds us that Mika can produce deep and meaningful lyrics alongside ‘bubblegum pop’ moments. It’s a pity the album’s lead single ‘Celebrate‘ finishes the album, I can understand why the record company chose it as a single but it is no-way near the best track on this album. With this album Mika has managed to slowly push his music forward without alienating his fans who enjoyed his first and second albums. There is much to admire here and I would rate this as an 8/10 album. For more Popledge awesomeness, follow Sarah on Twitter and/or be a part of her vibrant Facebook Fanpage. RADIO ALERT: “Underwater” by Mika is getting 5 plays a day on our station.IF you are reading this on a mobile device (smartphone, tablet etc. ), CLICK HERE to listen to our radio station. If not, listen to our station from ANY part of the world by clicking on the button below. 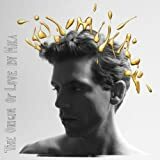 6 Responses to "Mika – “The Origin Of Love” : Album Review"
Thanks for the review, it’s quite interesting, but I have to say that Mika’s “‘bubblegum pop’ moments” are never too light when it’s about lyrics, no matter how much it feels so. It’s always about deeper meaning. Because of the light touch of music and pop melodies, people usually misunderstand him, or not even trying to understand. @ACLAY: Glad you liked the review! @Marina: Full credit goes to our affiliate blogger Sarah for the review. She has really hit the nail on the head with this one! @nena: Very true. I totally agree!